Huddersfield Town moved from the Leeds Road ground in 1994, having played over 1500 football games there since 1907, However it wasnt just Huddersfield who used the ground, in the 1940’s Man Utd played a home game there while Old Trafford was being repaired and more recently Bradford City used it for several games following the Valley Parade disaster. Sadly the football ground has long since gone, all that’s left is a plaque depicting where the centre spot used to be, this can now be found in a B&Q car park !! The picture below from a 1970's Football Review magazine shows the ground as it used to look. 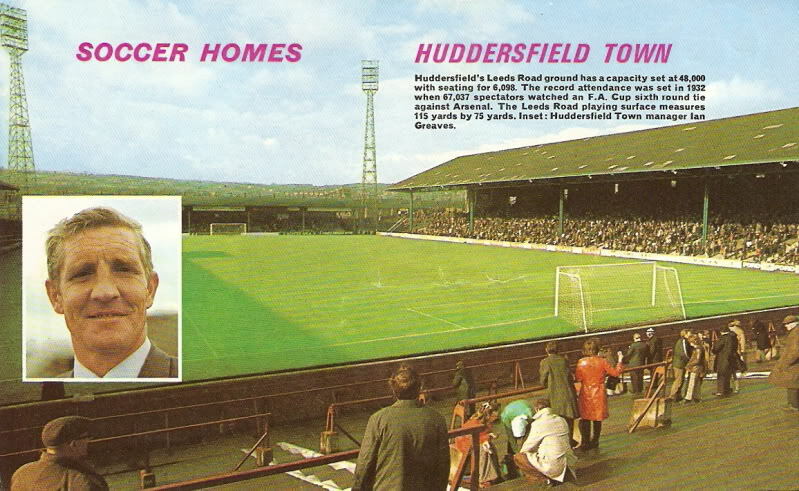 "Huddersfield Leeds Road ground has capacity set at 48,000 with seating for 6,098. The record attendance was set in 1932 when 67,037 spectators watched an FA Cup sixth round tie against Arsenal. The Leeds Road playing surface measures 115 yards by 75 yards. Inset :Huddersfield Town manager Ian Greaves"